Air Conditioning, Steering Wheel Audio Control, Power Windows, Cruise Control, Power Doors! Hot Deal! We've marked this unit down $3000 from its regular price of $18888. The family friendly Dodge Grand Caravan is Canada's favorite minivan. 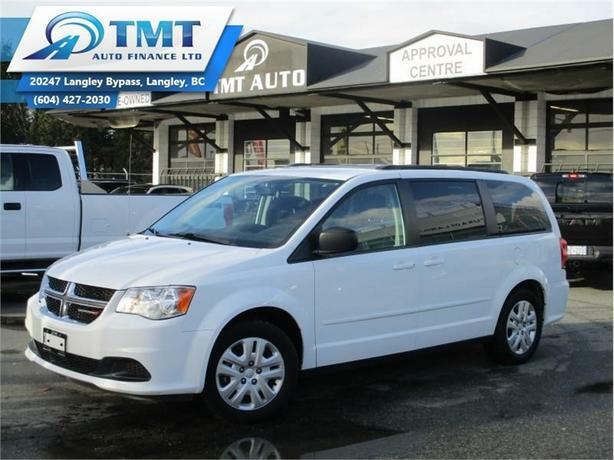 This 2014 Dodge Grand Caravan is for sale today in Langley. This Dodge Grand Caravan offers drivers unlimited versatility, the latest technology, and premium features. This minivan is one of the most comfortable and enjoyable ways to transport families along with all of their stuff. Dodge designed this for families, and it shows in every detail. It's no wonder the Dodge Grand Caravan is Canada's favorite minivan. This van has 105518 kms. It's white in colour and is completely accident free based on the CARFAX Report. It has a 6 speed auto transmission and is powered by a 283HP 3.6L V6 Cylinder Engine. This vehicle has been upgraded with the following features: Air Conditioning, Steering Wheel Audio Control, Power Windows, Cruise Control, Power Doors. Our Grand Caravan's trim level is SXT. This Grand Caravan SXT is an excellent value. It comes with dual-zone air conditioning, steering wheel-mounted audio and cruise control, power front windows, power locks with remote keyless entry, Stow 'n Go fold-flat second and third-row seats, Stow 'n Place roof rack system, and more! To view the original window sticker for this vehicle view this http://www.chrysler.com/hostd/windowsticker/getWindowStickerPdf.do?vin=2C4RDGBG3ER184197. Buy this vehicle now for the lowest bi-weekly payment of $103.51 with $0 down for 84 months @ 4.99% APR O.A.C. ( Plus applicable taxes - Plus applicable fees ). See dealer for details.